We understand that people do want to walk the Camino, but would rather not sleep in albergues, the communal dormitories available along the trail. Some pilgrims enjoy having their own bedrooms with a door, an en-suite bathroom, and plenty of hot water! Our self-guided clients do not want or cannot carry all their belongings with them. In fact, they enjoy being able to add some extra weight to their load and have some creature comforts, such as that Ipad! Are you nervous and scared! Coming to a foreign country to walk for a couple of weeks is daunting no matter how many books and web forums you've read. You want more than just an Orientation Packet sent to you in the mail - you want a LIVE person to answer your questions and help you take those first steps on your journey. Independence can be great when traveling, but it is also nice to have some occasional companions to share those tales from the trail and a meal or two! A Fresco Tour guide will hand deliver your Orientation Packet and give you a detailed meeting on the first night in Sarria. Your Welcome Packet is filled with all the materials you'll need to transform into a pilgrim: Your credentials (Pilgrim's Passport), a scallop shell, daily maps of the route, a guide book with historical information of the villages that you will pass through, and a few other goodies for the trail! We'll answer any questions that you have before starting your journey to Santiago and on the next morning lead you out on The Way! 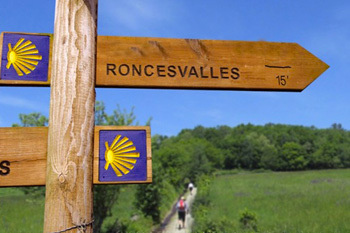 7 nights in a combination of 3 & 4 star hotels, restored manor homes, and small pensions / inns located on the Camino. All rooms have their own bathrooms. We've chosen places for their hospitality, comfort, and location. *Keep in mind that as you will be walking through rural countryside, the availability of 3 & 4 star hotels all along the route is not possible. All breakfasts are included with your hotels. We have arranged that they will be supplemented from the standard Spanish breakfast of coffee & toast. The first night of the itinerary, our guide will take you for dinner at one of our favorite places in Sarria - wine and beer included. 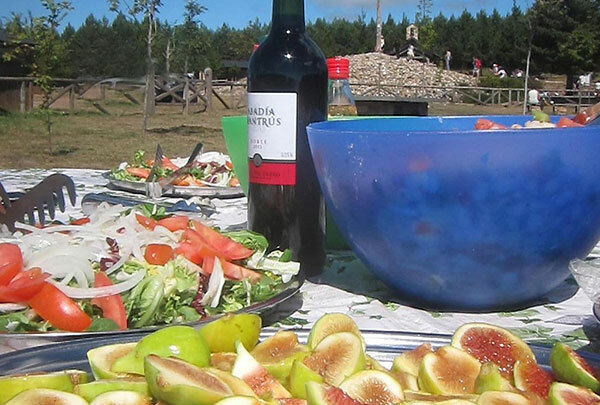 Afterwards, we will provide you with a list of places along the Camino with food recommendations. Let us know if you have any dietary restrictions and we can ask our hotels to accommodate for those as well! Although this tour is Self-Guided, we've limited the size of each departure to 15 passengers. Availability is on a first come, first serve basis. We will arrange for the transfer of 1 suitcase / piece of luggage (51 lbs) per person between your hotels on your walk along the Camino. If you require more than 1 bag, please contact us for details. In Santiago, our local art historian will provide you with a guided visit of the Cathedral and the surrounding squares. Minimum of 5 people for this service to be provided. We are here to help! Need assistance with hotels prior to or after your trip? Train tickets to Ponferrada? Returning from Santiago? Questions about what to wear? Need a taxi while on the trail? Based in Spain, we are here to make sure that your trip runs smooth as can be - we are available! What is the weather like on A Fresco Start 115KM Tour? The Camino de Santiago covers over 750 KMs of Northern Spain and therefore has very different weather conditions depending on the region. A Fresco Start 115KM covers the last 115 KM's of the Camino in the Northwest region called Galicia. Here we enjoy a more temperate climate than other parts of the Camino de Santiago and in July and August the heat is not overwhelming like it can be on the plains of Castilla y Leon. What is the terrain like on A Fresco Start 115KM Tour? In Galicia, the region where we walk, the terrain is green rolling hills - there are neither steep climbs nor treacherous descents. The trail itself is a combination of very well maintained compact dirt and stone footpaths and small country roads. 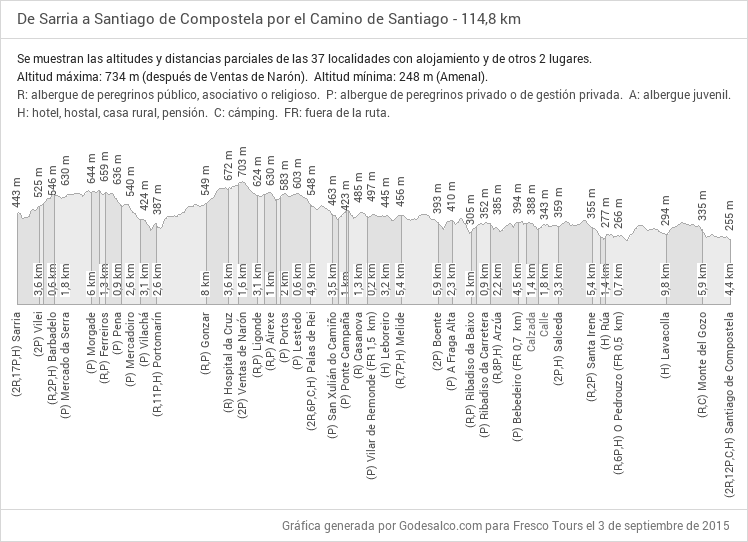 What is the change in elevation on A Fresco Start 115KM Tour? How many kilometers are walked each day on A Fresco Start 115KM Tour? The amount of KMs scheduled for each day varies on average from 14KMs to 23KMs. 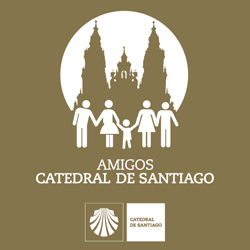 You will walk the last 100KMs to Santiago, which is the requirement by the Pilgrims' Office in Santiago if you are going to ask for the Compostela Certificate. What if I am unable to walk the scheduled daily kilometers? We will provide you with daily maps of your walk. These maps include the elevation gain and loss along the stage, the address and a detailed map of where your hotel is located, our favorite restaurant recommendations along the trail for lunch and dinner, and a list of taxi phone numbers in case you need a lift. How do I get to A Fresco Start 115KM Tour starting point? 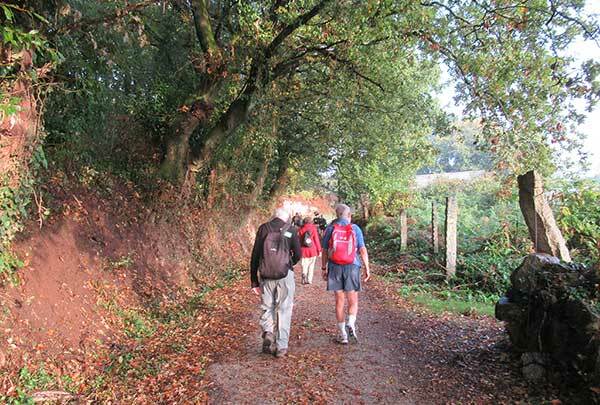 Sarria (Spain) is the official starting point of A Fresco Start 115KM Camino tour and can be reached via train, bus or plane, depending on your departure city. If you are traveling from Madrid, the easiest way are the direct trains (RENFE) that run twice a day. You also have a bus option which will require a transfer in Lugo. The quickest, but not the most economical way, would be to fly from Madrid to Santiago (Ryanair & Iberia airlines: 1 hour), and then take a taxi from Santiago to Sarria (1:30h). If you are traveling from A Coruña (Galicia), one can take the bus to Lugo and then transfer to Sarria. Trains (RENFE) run five times daily from A Coruña to Sarria. How do I get from Santiago Compostela to Madrid and other cities? There are now RENFE trains that will get you from Santiago to Madrid in less than 6 hours. While routes and availability may vary upon time of booking, click here for a sample timetable. The direct trains are listed as Alvia. If you are looking to fly, there are excellent internal flights that fly Santiago to Madrid. For a complete list of companies that service the Santiago airport, please click here. Can you help with purchasing online train tickets on the RENFE site? How do I get from the Madrid Airport to the Madrid Train Stations? In addition, there is an express bus that services the all terminals at the airport with the Atocha Train Station: http://www.emtmadrid.es/Bloques-EMT/Aeropuerto.aspx?lang=en-GB. What type of boots do I need for A Fresco Start 115KM Tour? What sort of conditioning do I need to undertake A Fresco Start 115KM Tour? We encourage you to walk before and be prepared for your own enjoyment. As you will be walking from inn to inn, you should be prepared to cover the day's full stage. They say your Camino begins once you decide to do it, so enjoy your "training" walks and get those KM's in before your arrive to Spain! As a bit of insurance, we will also provide you will a list of taxi phone numbers... just in case. 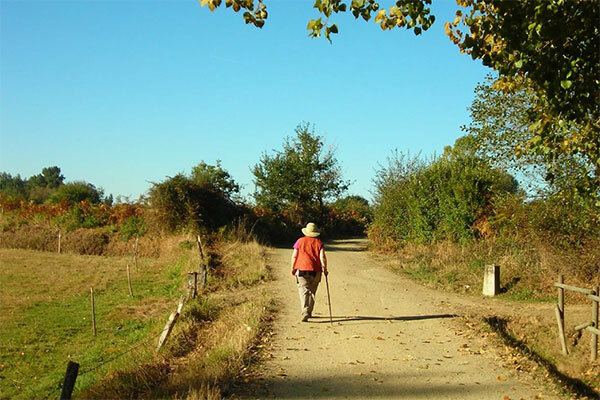 When do most people walk the Camino de Santiago? According to the Pilgrim's Office in Santiago de Compostela, in 2017, 35% of all pilgrims who requested the Compostela arrived in July and August. This makes sense since many Europeans and students have their vacation time in the summer. Whenever you decide to walk, you will always be able to find that "quiet time" for yourself along the trail. In addition, walking with Fresco Tours means that you won't have to worry about your meals, your pack, where you'll sleep, or anything else. You do the walking and leave everything else up to us! For complete pilgrim statistics, click here.